SALT LAKE CITY, UT | April 15, 2019 – MTN OPS, LLC, the leader of outdoor performance supplements, today announced that the company has partnered with acclaimed outdoor enthusiast and author Eva Shockey to launch a unique product line of performance supplements targeting women. The Eva Shockey Signature™ series was created for the everyday woman who wants to “Conquer More” and includes Egg White Protein as a nutritious endurance enhancing protein, as well as Super Greens and Collagen Peptides to boost metabolism and keep one’s skin, nails, hair and body feeling vibrant. Super Greens. This organic superfood powder utilizes chlorophyll rich greens that are harvested young and then quickly preserved to deliver optimal nutrition and quality. The result delivers natural energy, helps to improve skin health and aids in strengthening the immune system, all the while helping the body’s metabolism and overall digestion. Collagen Peptides. With 20 grams of collagen peptides, yielding 18 grams of non-whey protein, this powder product assists with strengthening skin, nails and envy-inducing healthy hair. Collagen peptides have also been proven as a nutrition solution to support strong and flexible tendons and ligaments, contributing to high performance and fast return-to-training. Egg White Protein. This dairy free and delicious vanilla flavored powder blend delivers 20 grams of fat and cholesterol free protein, including all nine of the essential amino acids for improved performance. It’s the perfect option for those aiming to increase their protein consumption without increasing their consumption of fat or cholesterol. “From scaling rugged mountains 8,000+ feet above sea level and hitting the gym for an intense full-body HIIT workout to taking a barre class for precise isometric exercises and chasing after my toddler daughter, I lead a dynamic active life. I’m thrilled by my expanded partnership with MTN OPS. 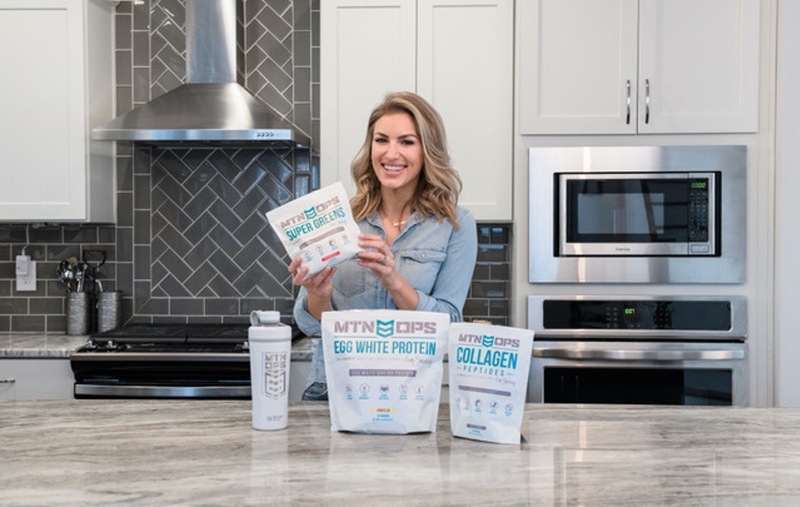 Together we were able to devise a nutritious signature product line that increases performance levels and kicks your healthy lifestyle up a notch,” said Eva Shockey. To learn more about Eva Shockey’s Signature line, please visit www.MTNOPS.com/Eva. Order now and receive the Eva Shockey digital cookbook (a $10-value), which contains 12 tasty recipes from protein pancakes to Pina Colada smoothies, and a MTN OPS shaker bottle. MTN OPS is the leader of outdoor performance supplements and provider of industry leading products such as IGNITE ™, YETI ™, and BLAZE ™. Founded in 2014, MTN OPS has developed several product lines that assist consumers achieve more energy, weight loss and overall health and nutrition. Through the MTN OPS Operation Conquer Hunger program, MTN OPS hopes to lift others by sharing health and nutrition with children who otherwise would not have the chance to receive it. To date, MTN OPS has provided over 900,000 free meals to those in need. Visit www.MtnOps.com or fine retailers, such as Cabela’s, Sportsman’s Warehouse, Scheels and Amazon, for more information. Eva Shockey is an author, a top TV personality, a rising social media star (2M & counting! ), a lifestyle blogger, an acclaimed bow hunter, a conservationist and a brand ambassador. She burst onto the scene about 15 years ago as the co-host of Outdoor Channel’s Jim Shockey’s Hunting Adventures, chronicling her worldwide quests with her father, legendary outdoorsman Jim Shockey. The competitive Latin ballroom dancer turned outdoor influencer has since become a proverbial wrecking ball for breaking down barriers of the male-dominated arena, ushering in a new wave of women and young girls passionate about outdoor pursuits. Along her bold journey of self-discovery and empowerment, which she details in her memoir – Taking Aim: Daring to Be Different, Happier, and Healthier in the Great Outdoors (Convergent), Eva has launched a digital series, Eva Shockey’s Outdoor 101 on Facebook Watch, and inspired many to follow their passions, to blaze their own trails, and to get outdoors. For more on Eva Shockey, please visit www.evashockey.com. Follow her on Facebook, Twitter and Instagram.